Back when Episode 2 premiered, I really didn’t buy much in terms of action figures. I saw the Sneak Preview figures at stores and afterwards those same stores carried a rather modest amount of the regular carded figures, but at the time the emphasis tended to be on pre-posed action stances with only a smatter of useful articulation on each character. 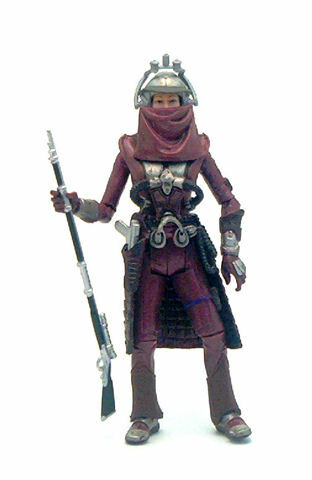 All in all, I must have gotten like four or five figures from the Attack of the Clones segment of the Saga line, and one of those was the second version of Zam Wesell. 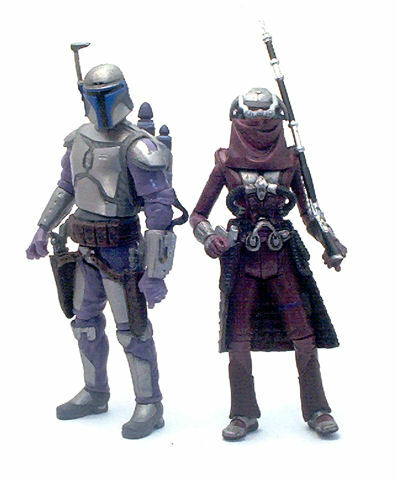 Fast forward to 2010, and Hasbro treats us to an improved version of the clawdite bounty hunter. The new Zam Wesell (VC30) is pretty much the definitive version for the character. The sculpture is very detailed and faithful to the original costume, while the articulation is expertly concealed by the character design. • Peg & hinge knees. With such a elaborate character design, a few joints have some limits imposed on their movement range. Sitting poses would be difficult due to the rubber skirt and the shoulder pads won’t allow Zam to touch her own head, but overall the motion range is more than enough for play or display. 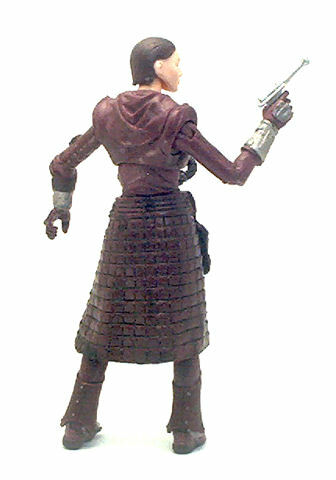 Zam is molded almost entirely in a dark burgundy plastic, with only the head(s) molded in a flesh tone material. The costume is complemented with gunmetal paint applications for the armored sections with a black wash applied on top to achieve a tarnished metal look. The wash also extends to the rubber skirt piece, enhancing the definition of the surface texture. 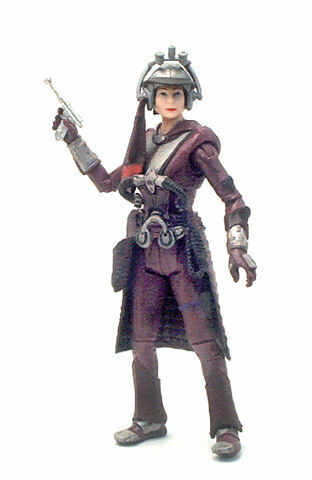 What sets this Zam Wesell apart from previous releases is the extras she come packaged with. The figure comes with two heads, one human with a fairly good resemblance to actress Leanna Walsman and an alien clawdite head. The human head is pretty and the eye and lip details are neatly painted; the hair is sculpted short and painted in a reddish brown color. The clawdite head is also molded in flesh colored plastic, but it was painted entirely in a greenish gray color with a darker paint wash applied to bring out the sculpted texture. The eyes are also cleanly painted although the overall effect is a little duller. Zam’s skullcap/helmet fits both heads perfectly and remains in place without trouble. 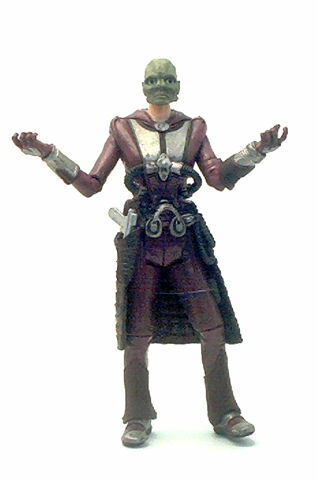 It has a pair of goggles that pivot over Zam’s eyes and also pegholes to affix either one of the two included veils. One of these veils covers the entire face except for the eyes, while the other just hangs from one side of the helmet, leaving the face uncovered. 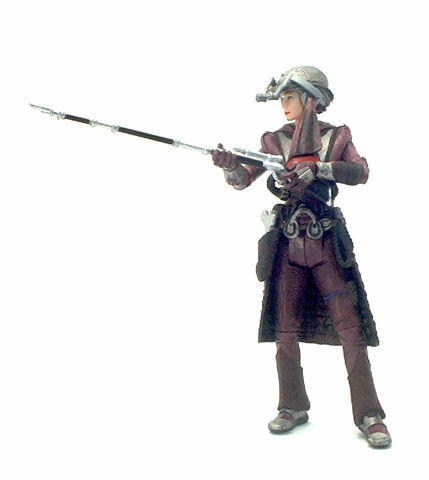 As far as weapons go, Zam comes with a silver blaster pistol that fits inside the sculpted holster at her belt and a long rifle molded in silver plastic with black paint decorations. Even though I absolutely love this figure, there are a few minor nits to pick. One is that having the veils on does limit the range of movement on the neck, since moving the head around will cause them to fall off. The other is that putting the clawdite head on does not look as good as I’d want, because the flesh-colored neck post looks very distracting with the alien head. None of these issues is really a deal breaker, in my opinion, and the Vintage Collection Zam Wesell is, without a doubt, among Hasbro’s finest offerings for 2011.